Everyone loves a good superhero story. Superheroes have been a fixture in American pop culture for decades, but in the past 10-15 years we’ve witnessed a resurgence of superhero mania. Between movies, TV shows, toys, and even national conventions, the superhero fever is real. Given that superhero stories are characterized by themes of fighting against evil, defending others, and promoting justice, many parents encourage their children’s engagement in superhero media, even as early as preschool. Echoing this sentiment, in 2015 CNN released an article headlined, “Never fear, parents: Superheroes help kids soar.” The piece emphasized the power of superhero narratives to inspire confidence and prosocial behavior in kids, touting characters like Spiderman, Batman, and Captain America as important role models for today’s youth. Although many of our favorite superhero movies do indeed promote well-intentioned messages about standing up for peers and protecting others, a new study suggests that kids who are more engaged with superhero media may be learning less about tackling evil and more about tackling each other. The study, led by Dr. Sarah Coyne (Brigham and Young University) and published in the Journal of Abnormal Child Psychology last month, demonstrates that preschoolers with greater superhero engagement at the initial time of study were more likely to exhibit aggressive behavior a year later. In contrast, superhero engagement had no impact on their prosocial or defending behavior (e.g., standing up for bullied friends). The findings suggest that although superhero narratives incorporate themes of prosocial behavior and standing up for good/justice, preschoolers seem to be selectively influenced by the corresponding themes of violence and aggression, even if it’s for a good cause. The study: What did they do? The researchers recruited 240 children between the ages of 3 and 6 and their parents (mostly mothers) to participate in the study over the course of a year. At the beginning of the study, parents were asked to report how much their children identified with a list of various superheroes (e.g., Spiderman, Captain America) and how frequently their children watched superhero TV shows or movies. They also rated their children’s engagement in aggressive behavior, including physical aggression (e.g., kicking/hitting others) and relational aggression (e.g., excluding other kids), as well as their prosocial behavior (e.g., helping peers) and defending behavior (i.e., non-aggressively standing up for bullied classmates). Finally, the parents answered an open-ended question about their opinions on superheroes. Although the main focus of the study pertained to parents’ reports of their children’s behaviors, the researchers additionally conducted interviews with the participating children, asking them to identify their favorite superhero and explain why. In all analyses, the researchers also took into account the average amount of time the children spent watching TV and the average violence of the television programs they watched. Then, a year later, parents again reported on their children’s aggressive, prosocial, and defending behavior. The study: What did they find? Before getting to the main study findings, it’s worth reviewing some of the general patterns of parent and child superhero involvement. For example, almost one third of participating parents said they thought that superheroes had a positive influence on their children, with the majority of those parents mentioning how superheroes serve as “positive role models” by engaging in defending behavior. In contrast, only 12% of parents actually thought that superheroes had a negative influence on their kids, primarily citing violence as their concern. The remaining 60% of parents had mixed or indifferent feelings about the influence of superheroes on their kids. What about the kids? Whereas some kids liked superheroes because of the corresponding merchandise (26%), like clothing and toys, others were drawn to their personalities (21%). Specifically, several kids appreciated the defending behavior of their favorite superheroes (e.g., saving people), whereas others were impressed by their violence (e.g., smashing; punching). Taken together, these initial findings suggested that parents and kids were aware of both the potentially positive and negative aspects of superhero personas. The main focus of the study was to examine the impact of children’s superhero engagement on their subsequent aggressive and prosocial behavior. The authors found that kids who had greater superhero engagement at the beginning of the study were more likely to exhibit both physical and aggressive behavior a year later. In other words, the preschoolers who wanted to be more like superheroes (e.g., personality, appearance) and watched more superhero TV shows and movies also were more prone to subsequently physically hurting, ignoring, and excluding their classmates. In contrast, superhero engagement at the beginning of the study had no impact on children’s subsequent prosocial or defending behavior. That is, identifying with superheroes and watching more superhero content did not increase the likelihood that kids would help and stand up for their classmates. Interestingly, these effects were similar for both girls and boys. The findings of this study highlight that as early as preschool, kids are learning and modeling their behavior based off of exemplars, both real (e.g., parents) and imagined (e.g., superheroes). 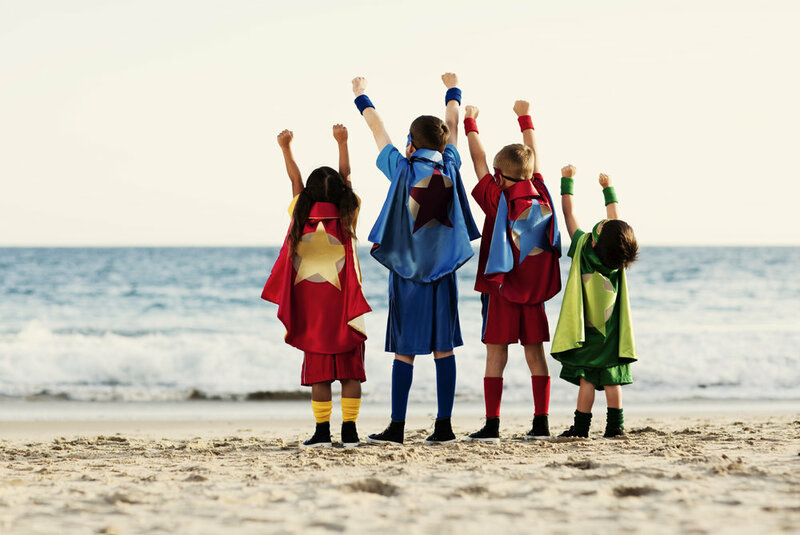 Despite the fact that superhero narratives often center around themes of prosocial and defending behaviors, children in the current study did not show any changes in their positive social behaviors as a function of their superhero involvement. Instead, the findings suggest that themes of violence and aggression in superhero programs may be more salient influencers of kids’ behavior. Why didn’t superhero involvement teach kids to be nicer to one another? One possibility is that children have trouble disentangling positive and negative behaviors. In superhero narratives, where there is a combination of aggressive and prosocial content, kids may hone in on the aggression insofar as it tends to be more salient and rewarded. In contrast, prosocial behavior can be more abstract or subtle, making it difficult for kids to isolate and appreciate its importance in the context of an action-packed storyline. This also isn’t the first time we’ve seen the striking impact of violence exposure on children’s behavior. In a famous series of psychological experiments during the early 1960s, researcher Albert Bandura demonstrated that children tend to model aggressive behavior of adults. Specifically, children who watched an adult pummel and beat a blow up doll (referred to as a “Bobo doll”) were more likely to then treat the doll in a similarly aggressive manner. Although it may seem obvious to us now that children exposed to aggressive modeling showed more aggressive behavior, at the time there was little empirical evidence to support this fact. This sort of observational learning discussed by Bandura several decades ago continues to be of central relevance when considering the impact of violent media on children’s behavior, particularly at very young ages. For example, during the preschool years, children still have trouble making distinctions between what is reality vs. fantasy and have not fully developed an understanding of what qualifies as “appropriate” social behavior. As such, exposure to aggressive behavior or violent media during childhood could be particularly impactful. With children being exposed to television and movies from fairly early ages, it is increasingly important to develop strategies for breaking the link between violence exposure and children’s actual aggressive behavior. To be clear, these results do not suggest that children should have zero exposure to superheroes. Rather, it may be particularly important for parents and teachers to help children understand some of the conflicting messages presented in superhero movies and TV shows. For example, emphasizing the value in defending others while cautioning against the use of harmful violence can facilitate children’s ability to recognize both the good and bad in superhero behavior. Coyne, S. M., Stockdale, L., Linder, J. R., Nelson, D. A., Collier, K. M., & Essig, L. W. (2017). Pow! Boom! Kablam! Effects of Viewing Superhero Programs on Aggressive, Prosocial, and Defending Behaviors in Preschool Children. Journal of Abnormal Child Psychology.